Over the last couple of years, I’ve helped many organizations of different sizes and various industries that were struggling with Data Governance. Every organization recognized the importance of governing their data assets, and all were governing their data, at some level. Why was their Data Governance not working? It needed to mature. These conversations prompted me to think about how to best help companies measure how “mature” their Data Governance capabilities are. 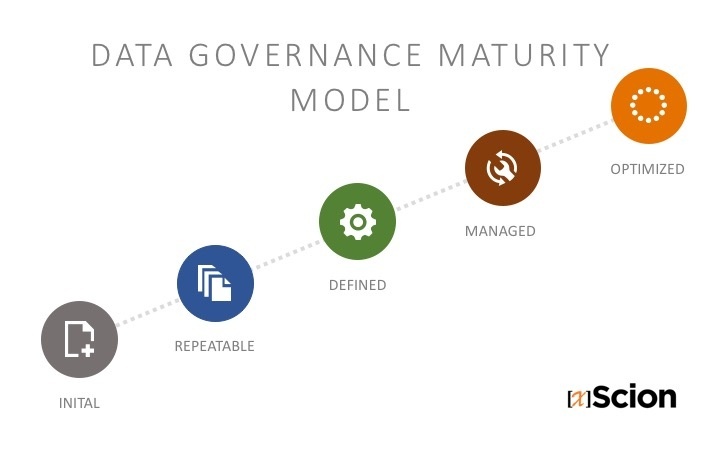 As with any operational function, Data Governance can be described in 5 maturity levels. As organizations mature through each level, their ability to manage data becomes more automated and consistent, thus reducing regulatory and compliance risk. How Mature is Your Data Governance? Do we have a person or group of people who are dedicated to understanding and communicating to the entire organization, all types of risks associated with our data? Do we have a person or group of people who document rules for managing our data in a way that we can demonstrate compliance during an audit? Have we developed and communicated clear policies related to data security? Do we feel confident about our ability to manage and protect confidential data from unauthorized access? Do we have defined Metadata Management policies that identify what data we have, where it resides, how it’s defined and used. Is this information available 24/7 to anyone who requests it? Do we have an established formal approach for managing Data Quality which includes: recording of issues, proactive ways to identify and address issues, using logs to track and prioritize issue resolution? Do we have an Enterprise Data Warehouse which provides easy access to authorized users, supports data integration and Business Intelligence/Reporting? Have we assigned people and implemented technologies to manage and share our master and reference data? Have we established a Data Governance Council consisting of business, IT and executive stakeholders, who are given specific responsibilities for governing our data?